Screened porch additions are an excellent way to extend your home and bring the outdoors in. They provide an outdoor oasis for you and your family to comfortably enjoy the beauty and serenity that Mother Nature has to offer. We, at Fineline Construction, will ensure that you choose the best quality screened porch materials because it is an extension of your home and should transition seamlessly. We want to educate you about the many flooring materials available so that you can choose the best quality products that will enable you to enjoy your screened porch for many years to come. According to industry studies, pressure treated wood products remain the most commonly used decking material today. One thing to keep in mind, though, is that all pressure treated material is not created equal. It is important to purchase material that has had time to dry. Most large box stores carry very wet material. When you install very wet material, it tends to warp, cup, and splinter more. • Pressure treated products are readily available and are often a budget friendly option. • With proper maintenance and protection, you can expect a lifespan of 15 to 20 years for most pressure treated materials. • Wood is full of knots and warps very easily. Cupping, cracking and splitting is very common and will most likely happen within the first couple of years. • Wood can splinter and crack, therefore it can be very uncomfortable on your bare feet. • Wood can be very costly to maintain. The boards will need regular cleaning, coating and sealing for it to last. Most composite products are made from the same basic formula of recycled wood scraps and plastics, making them eco-friendly. They are available in a variety of colors but are completely compatible with paint and stain if you prefer to customize. Trex and Everlast are just a few of the top producers of composite products. The Trex Transcend series (pictured above) of products are some of the most superior products on the market today and ones that we highly recommend to our customers on a regular basis. • Excluding the occasional cleaning, most composite products are completely maintenance free. • Composite products are a great eco-friendly option. • The longevity and durability of composite products will outlastpressure treated wood by many years. 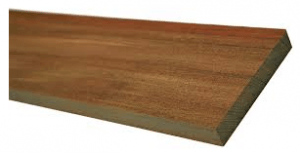 • The main disadvantage of composite decking is that the color does not go all the way through the product. This results in scratches and other damage showing easily. Therefore, there is essentially no way to repair it without replacing it. • Composite products are often more costly than pressure treated wood products. • Because several producers still use recycled wood products in their formulas, composite products are not 100% rot-free. Many companies that once specialized in only composite products are now producing PVC products. 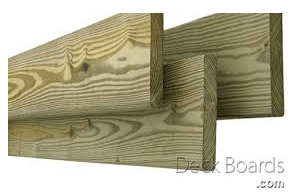 • PVC decking does not warp, twist or crack. 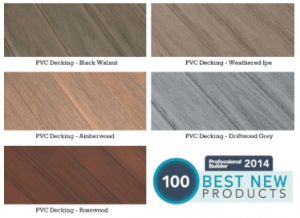 • PVC decking expands and contracts more than wood or composite products. • It is one of the most expensive porch flooring options on the market. There are several exotic hardwoods available on the market but the most commonly used are Ipe and Tigerwood. Ipe, pronounced e-pay, is one of the hardest species available. • It is naturally resistant to rot and decay. • No special preservatives are required but can be used by choice. • Naturally slip resistant and exceeds the Americans with Disabilities Act requirements for Static Coefficient of friction in a wet environment. • The life expectancy of Ipe is about 25+ years. Tigerwood is also a very durable species of exotic hardwoods and is very much like Ipe except that Tigerwood costs much less than Ipe and the color is different. • Mostly known for it’s wide variances in color. It is light golden brown to reddish brown with irregular black and brown streaks and can really make a statement. • The life expectancy of Tigerwood is about 20 years. • Exotic wood requires frequent maintenance to keep it looking sharp. Most people coat it with oil and if you fail to do this, it will likely fade quickly. Whether you decide to use pressure treated, composite, PVC or exotic hardwood flooring, your decision will set the tone for the rest of the project. We know the options are vast and overwhelming, so please feel free to contact us to discuss all of the above options in further detail. You can also visit our screened porch page for additional information. We look forward to the possibility of working with you on your new screened porch addition!